Sometimes a road trip opportunity comes out of the middle of nowhere, and it also TAKES you to the middle of nowhere. 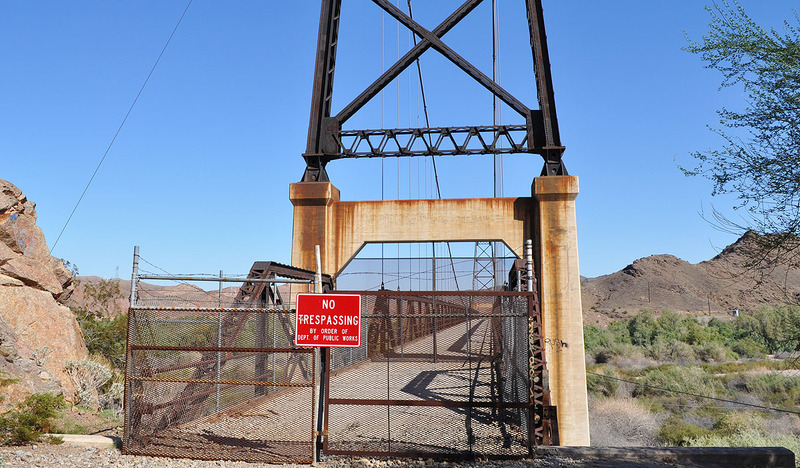 On Tuesday, my coworker Greg sent me an email entitled, “Seen this?” with a screen capture of what is known as the Bridge to Nowhere. Of course, I dropped all work-related activities and headed straight for Google. My colleagues at the office know me well. 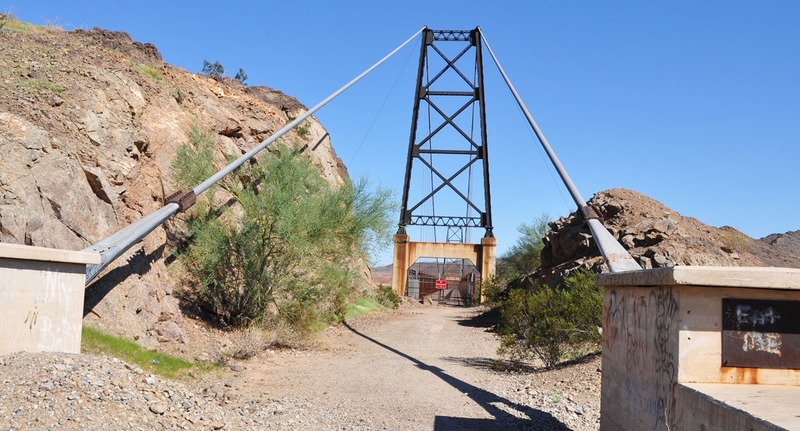 What I soon uncovered was the history of a very little-known 800-foot-long suspension bridge about 8 miles north of the desert community of Yuma, Arizona. I mentioned a few things about the bridge to my friend Jack. “Yuma – really? 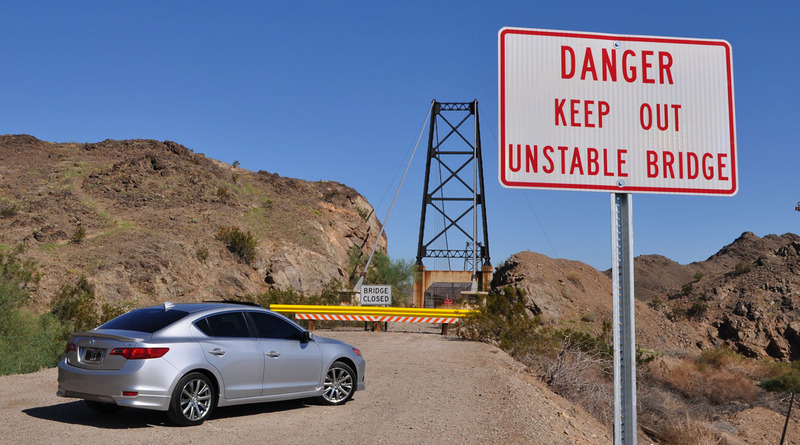 If you’re going on a day trip, at least have it be to Vegas or somewhere.” I was determined to make the trip even if it wasn’t to an exotic location, so I took to the streets bright and early on Sunday morning in my Acura ILX and headed westward. 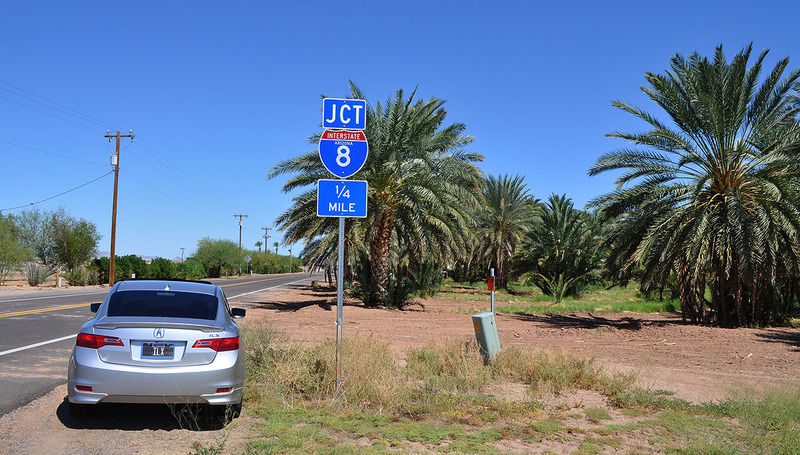 Yuma sits along Intestate 8, and it’s only 7 miles north of the Mexican border. The sun shines for about 90 percent of days in Yuma, making it the sunniest place on earth (specifically, the city receives 4,015 hours of sunshine per year). The town’s population booms in the wintertime when “snowbirds” from the midwest roll in with their 5th wheel travel trailers and spend a few months in its perfect climate. At Fortuna Road, Exit 12, I rolled off the main highway and headed north toward US 95. Following some directions I’d printed from Roadside America, I knew exactly where I’d be seeing the bridge. 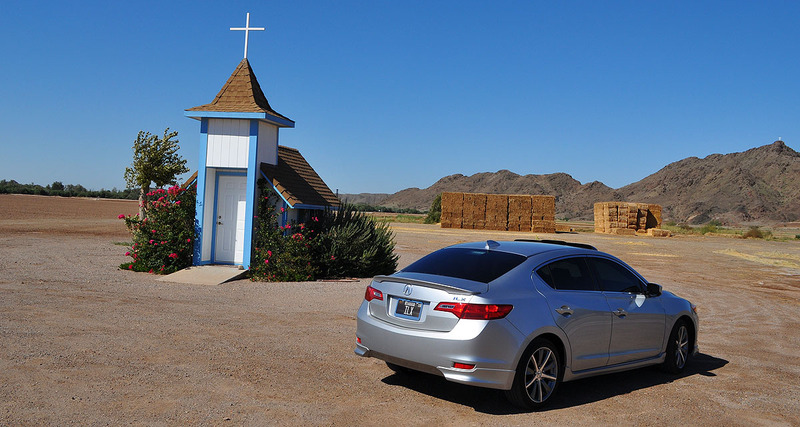 Sure enough, its two tallest spires beckoned from afar as I hit the brakes in the ILX and made a left-hand turn onto a gravel road that truly did look like it was in the middle of nowhere. Just 1/2 mile or so up the dirt road, I’d driven as far as I’d be able to. 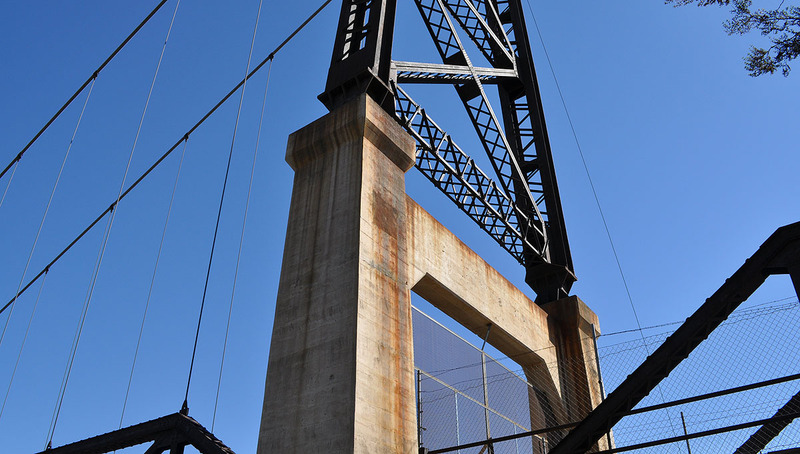 Multiple warning signs urged me to not take any further steps toward the bridge. 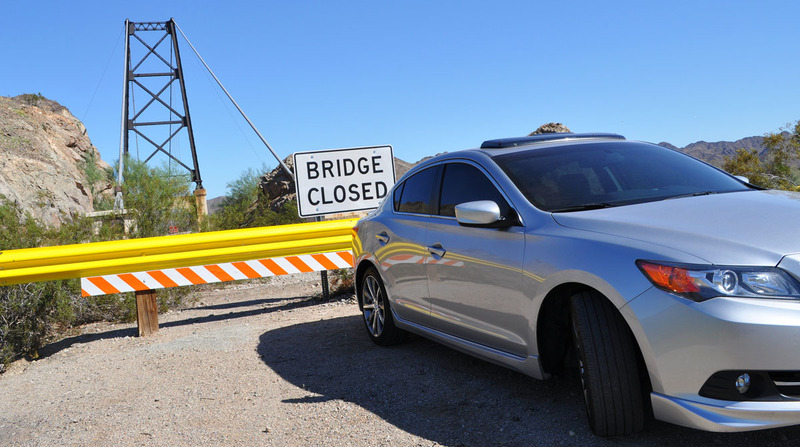 BRIDGE CLOSED; NO TRESPASSING; and UNSTABLE were some of the notifications I received. Still, I felt like I needed to get a closer look so I locked the car and started hiking. 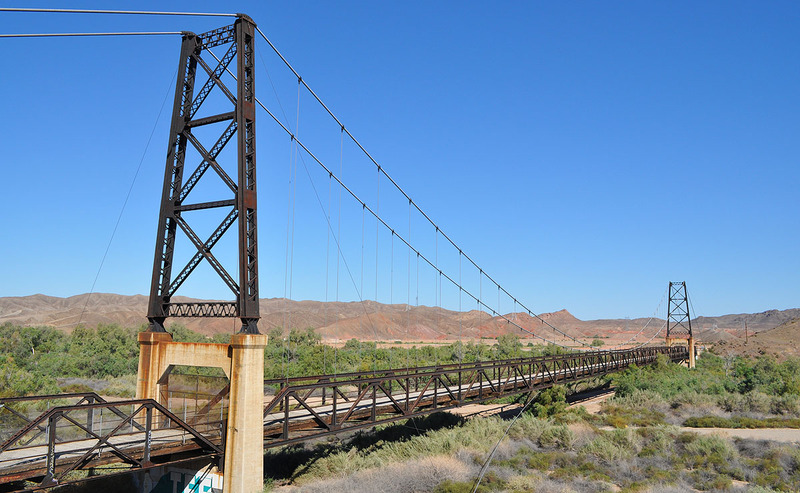 The bridge was built in 1929 in the name of Henry Harrison McPhaul, a notable resident of Yuma. Just a little under 40 years later, in 1968, it was deemed unfit for modern traffic needs — not difficult to understand, given its narrow width. 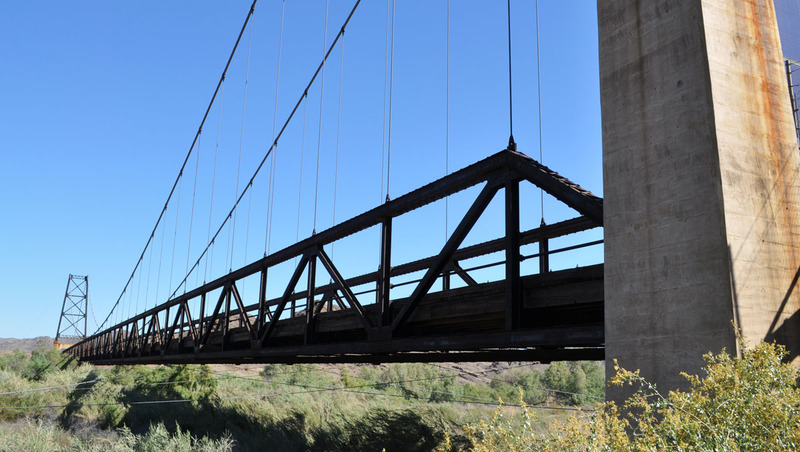 A larger bridge was built upstream, along with a dam that rerouted the river. 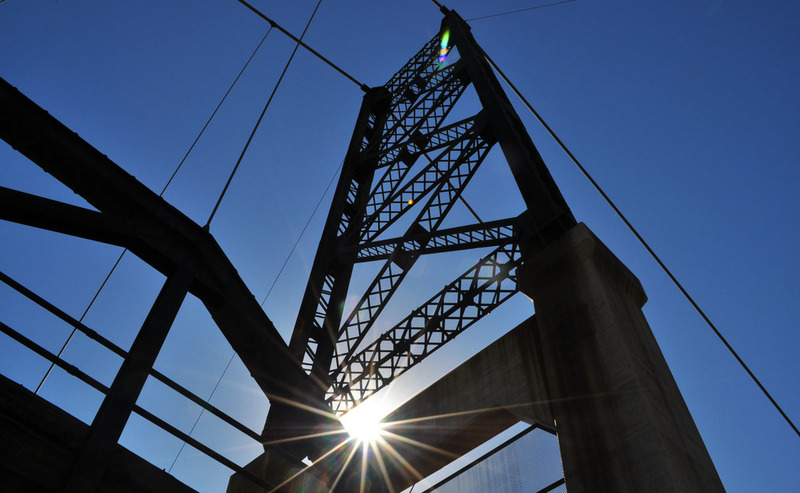 Today, the McPhaul Bridge is nothing but a roadside relic. It doesn’t go anywhere or serve any purpose at all, except for inquisitive road trippers like me. 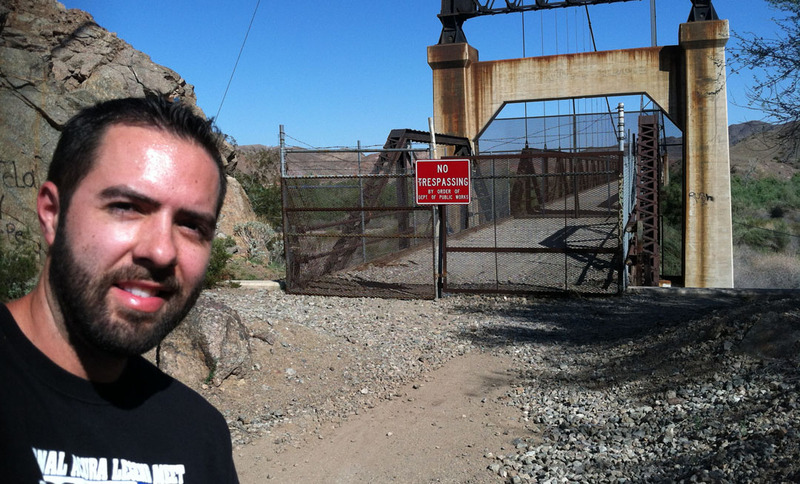 The actual deck of the bridge is completely shut off with a fence and padlock, so I did not walk along the top of it. 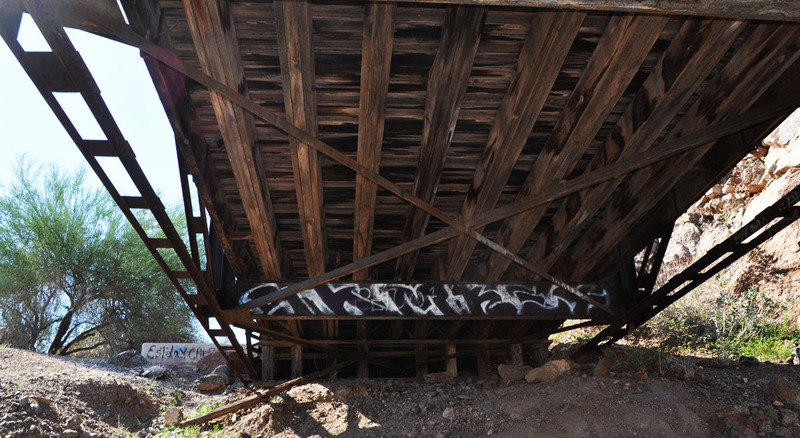 I did, however, hike down underneath the platform. Thick wooded brush was difficult to navigate, and I was wearing shorts so the sticks would frequently jab at my legs and scratch them. I had to tread carefully down there. The view of the underside of the bridge was worth it. 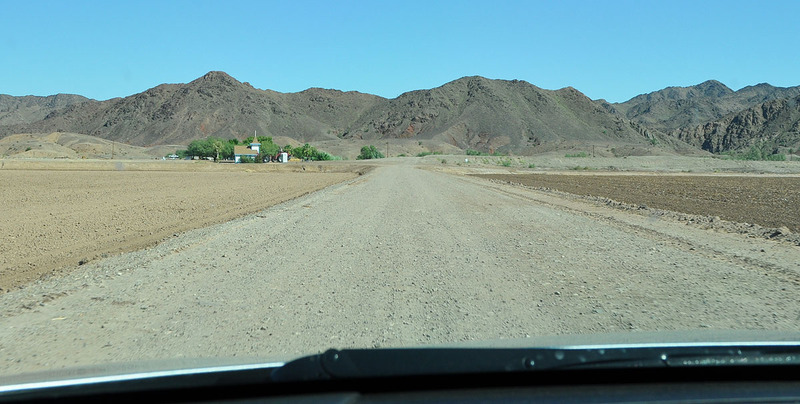 What was once a riverbed is now mostly dry, since the flow of water had been diverted in 1968. Here’s an aerial view of the north-south running bridge (center of the screen). At some point, I’d like to try and access the north end of it. 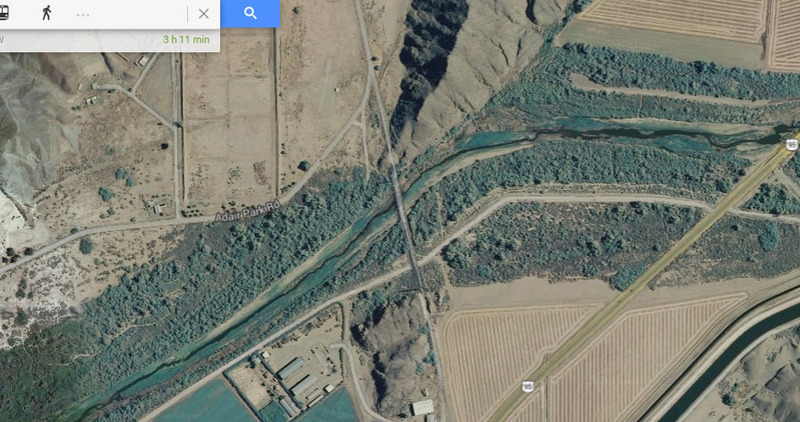 The roads on that side of the wash appear to be dirt based on Google Maps. Not even a mile up the road. another quick stop was to be made. 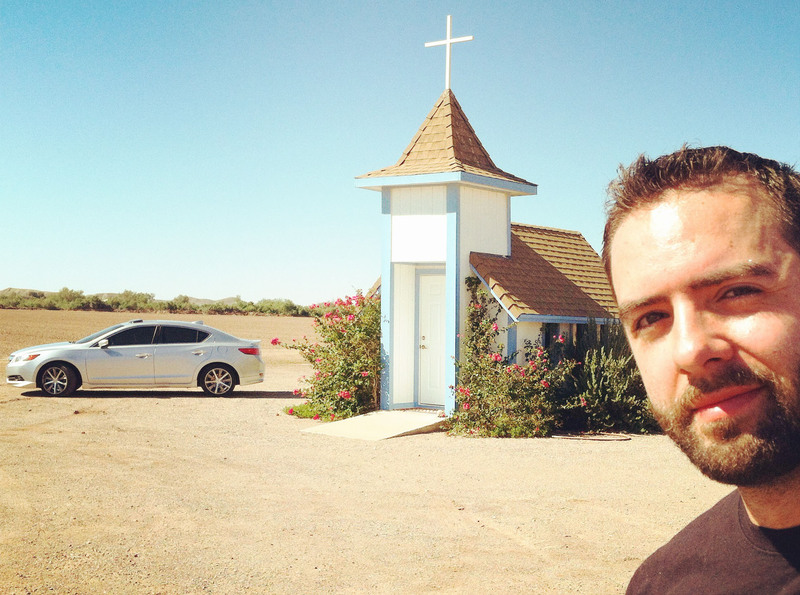 A white, hand-painted sign along Highway 95 said, “Pause; Rest; Worship.” Another dirt road presented itself to my left, so I veered north toward the tiniest church building I’ve ever set foot in. 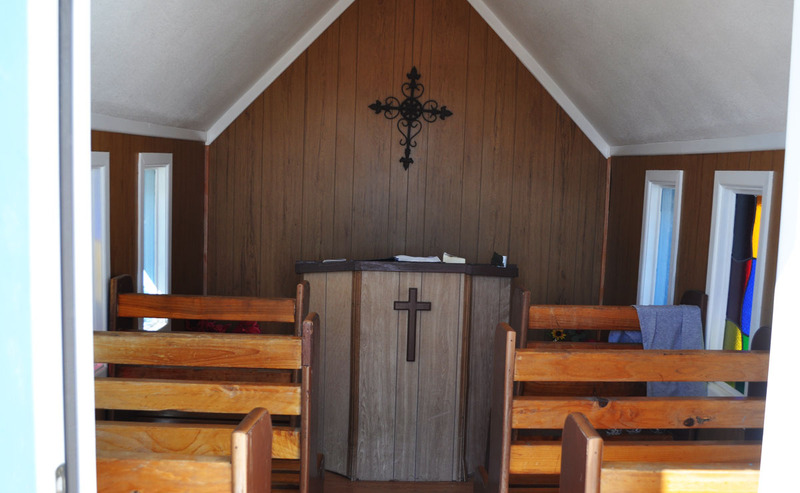 The “Tiny Church,” as it’s been named, dates back to 1995 and was built by a farmer on his property. There are 6 tiny pews in the 8-foot by 11-foot interior. I spent at least 20 minutes at the church and saw nobody else around. The front door was unlocked so I let myself in. 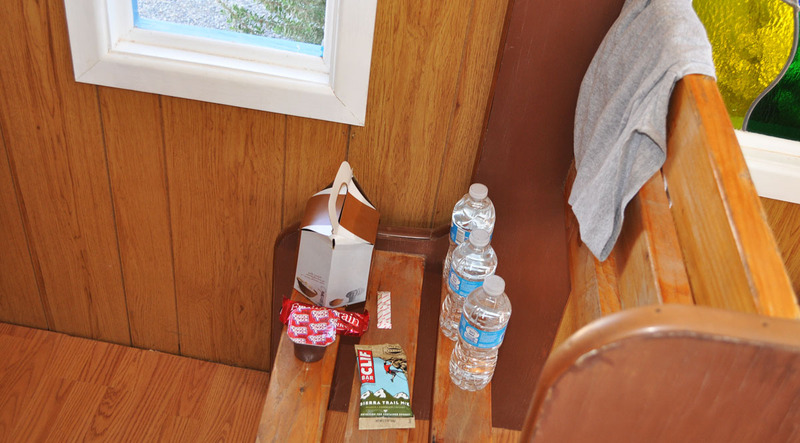 The front row had bottled waters and some pudding on it, maybe in case any worshipers needed sustenance? Sitting on top of the pulpit was a Holy Bible and a guest book, which I signed. My return trip to the Phoenix area was smooth sailing, as I-8 on a Sunday morning is very quiet and there are remarkably few 18-wheelers along that stretch of road. I did make just one more visit before calling it a day. Dozens of times I’ve driven past Exit 67 for Avenue 64E to “Dateland,” but it wasn’t until Sunday that I let my curiosity get the best of me and I pulled off Interstate 8 for a closer look. 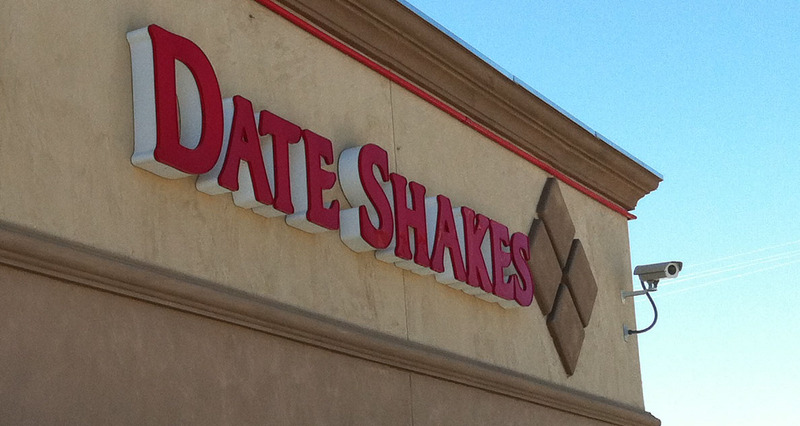 I’d known that Dateland was famous for its date shakes, but not much else. I was greeted by a modern service station and adjoining Quizno’s sandwich shop. For $4.50, I got myself a date shake. The flavor reminded me just remotely of a “jamocha” flavored shake from Arby’s. The consistency was really thick, and the chunks – well, they were a bit much. It was so chunky, in fact, that my straw kept getting plugged. Dates are a fruit that grows on a certain type of palm tree called a Phoenix Dactylifera. These palms can grow up to 75 feet in height. Dateland, Arizona started out as a stop along the railroad line in the 1920’s. Its irrigation pool doubled as a swimming pool. 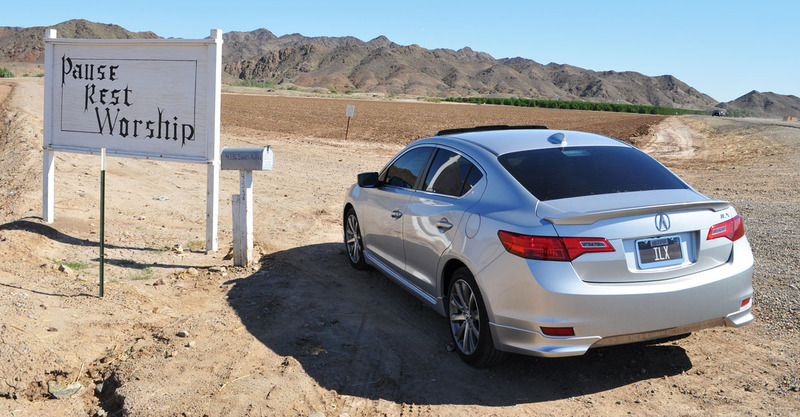 Today, Dateland’s source of industry primarily comes from its convenience as a pit stop for motorists cruising between Yuma and Phoenix along the interstate corridor. Thanks for coming along for the trip, and enjoy the rest of these pics! When you’re traveling this closely to Mexico, there are opportunities to buy Mexican auto insurance all over. 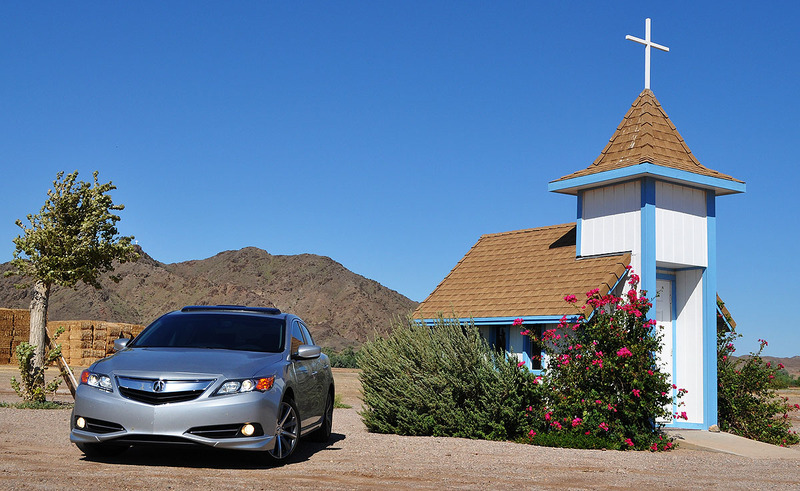 Sentinel, Arizona proudly touts its location in the Middle of Nowhere. Getting closer to Yuma after this steep pass. Here’s the approach of the Bridge to Nowhere. Cruising north on Hwy 95, all I could see were its tallest pillars. Getting closer after hitting the dirt road. This is the end of the road. At least, it has been since 1968. No Trespassing. I didn’t go out on the bridge deck; I just went underneath it. View from below. For being 85 years old, this thing is in pretty good shape. Here you can see the type of thick brush I was trying to trudge through. 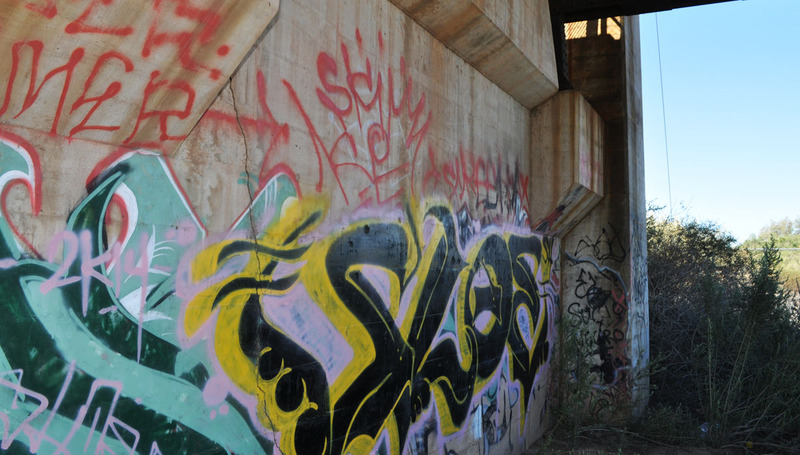 I love the architecture of old bridges and tunnels. View from the west side of the bridge. Heading back to the car – and a dust storm blowing in. Next stop: A little Sunday worship, on a miniature scale. Heading up to the chapel. Here’s a look inside. There are 6 very small benches. Apparently you can squeeze 12 people in here if you need to. I found some refreshments on the front pew. Signed the guest book and provided the blog address. Arriving in Dateland, Arizona for some fuel and a bathroom break. Those are date palms along the road. 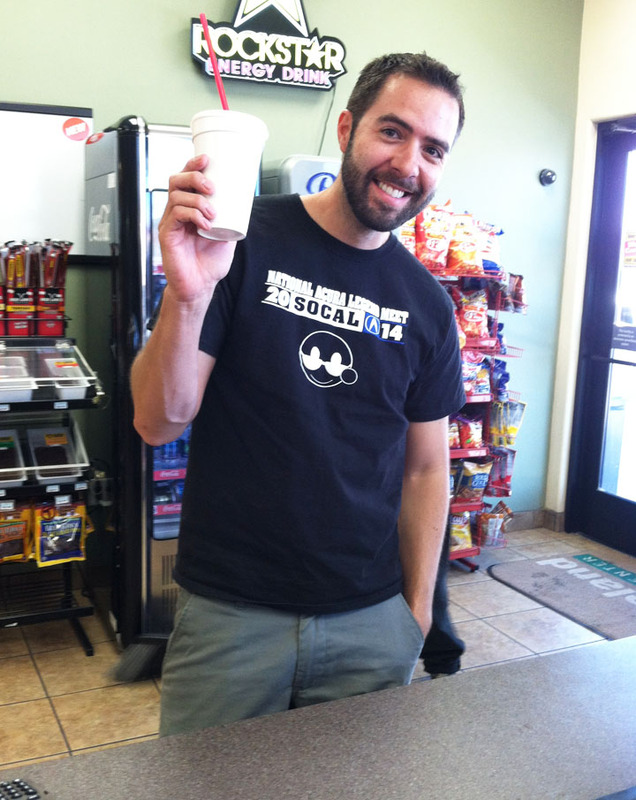 They sell 100-octane “racing fuel” at the Dateland gas station! I didn’t indulge… but I wanted to. Dates for sale. If only finding a date was this easy in the relationship world. Self explanatory Dateland license plate. Try one if you’re ever in the area! 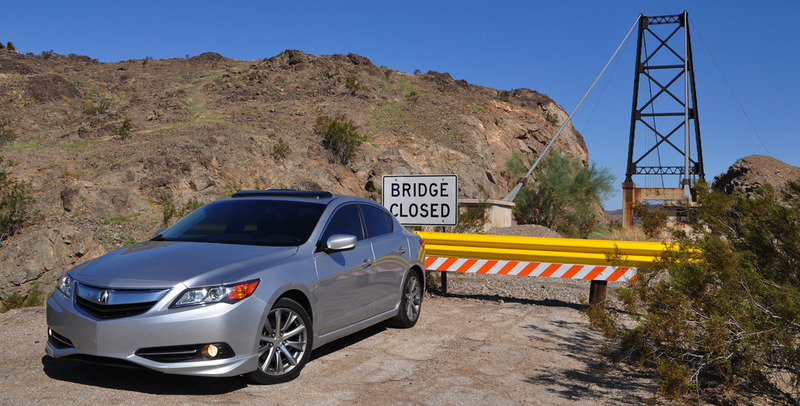 This entry was posted on September 15, 2014 at 6:27 am and is filed under Arizona, ILX, Road Trip. You can follow any responses to this entry through the RSS 2.0 feed. You can leave a response, or trackback from your own site. Just out of curiosity how much a gallon was the 100 octane? That’s a GREAT question and now I wish I’d paid better attention. By the time I realized the 100 was even there, I’d already punched ’91’ and the price for 100 cleared off. There was no price for the race gas listed on a sign at the entrance to the station or anything. I should have asked. Next time! Date Shake AND a bridge to nowhere? Now thats not something you come across every day. 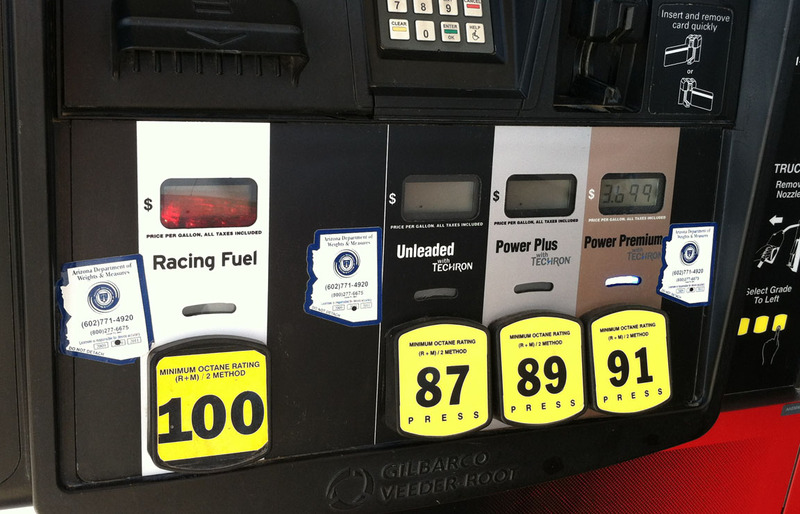 I wonder if the 100 octane gas would damage our engines/seals or anything else in our engines? I asked an (auto mechanic) friend of mine about that and he said that it would not cause any damage. The ILX only needed about 1/2 tank at that point. I should have just topped off with 100. Nice shirt, you look good in it. Was that church even big enough to have a restroom? There was no restroom in/attached to the church building, but there was a portable toilet just a few steps away to the north. I’m curious how much the 100 octane was too. The teggy LOVES 100 octane . . . I called it the poor man’s tune-up. I’d let the tank go near empty and put a gallon or two in and take it on the highway and go about 85. Amazing how much better it ran afterwards. That’s interesting. I guess I have a reason to get back to Dateland now and treat my cars to some of the good stuff. 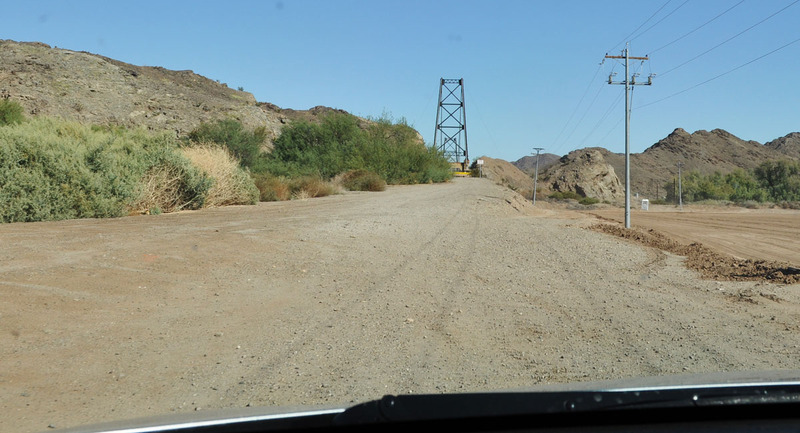 According to Google Street View, you can actually drive on a dirt road that runs under the bridge perpendicularly! Wow – you’re right. I was so concerned about tracing the path of the road that leads to the north end of the bridge that I didn’t even notice there was a dirt road in the (former) riverbed that goes right underneath it. Guess I need to plan another trip back to Yuma in the near future. One can clearly tell when another is a tourist!